The steamship Princess Sophia sank with an estimated 350 people on board 100 years ago near Juneau. Since the sinking corresponded with the end of World War I, it received little attention at the time. For some, this lack of attention left the tragedy without a sense of closure. 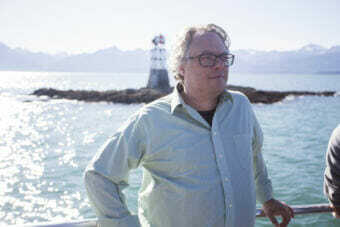 In mid-September, about 100 people embarked on a boat trip to Vanderbilt Reef in Lynn Canal — this tragedy’s ground zero. Among the passengers was opera soprano Kathleen Wayne. She sang two songs while at the reef — literally floating above the wreckage of the Princess Sophia. “It’s a very emotional space to be in. 350 people lost their lives — children, mothers, fathers, young people,” Wayne said. Behind her, Vanderbilt Reef broke the ocean’s surface like a craggy land creature coming up for air. And mountains lined the sides of the massive fjord. “You’re right above them. Singing about them. People nobody here has met. But feeling very connected with them through this music and these lyrics,” Wayne said. Another of the opera’s singers, tenor Bernard Holcomb, was in from New York researching his part and performing for the boat trip. “I think that this is a great opportunity to be here, to see it, to be here physically. Not just imagine it, but to be here physically and to know that there is wreckage beneath us. And that there were no survivors,” Holcomb said. Because of extreme tides and stormy weather, Holcomb’s character, Capt. John Leadbetter, was among the Juneau people who were unable to rescue anyone from the passenger ship. “I am accessing the feeling of guilt, the feeling of being out of control. I cannot control what is happening and that’s incredibly frustrating,” Holcomb said. The irony of boating to a shipwreck was not lost on many of the trip’s passengers. But the weather could not have been more different from the high winds, snow and low visibility the Princess Sophia faced 100 years ago. As our modern, diesel-powered catamaran safely circled the reef, it was hard not to imagine the suffering of all those people. Imagine being stuck, on a reef, in a storm with gale-force winds, in 1918, on a steamship with little-to-no communication. Now remember that they were stranded like that for 40 hours before the ship sank. Sadly, it was not OK. All aboard perished, and in the turmoil of the end of World War I, one of the worst maritime disasters of all time had little closure. And now, 100 years later it’s the anniversary of a tragedy. How do we honor that? In addition to the Emerson Eads, the opera features a libretto by Dave Hunsaker. It’s hard to say what the opera will do, or what it represents, until the curtain falls. And, like most art does, it will affect each person in a different way. Perhaps it will offer closure for some, commemoration for others. And, maybe, it’s a way to feel what those people felt 100 years ago. But, safely, from a comfortable seat in the audience. “The Princess Sophia Opera” plays 8 p.m. Saturday, and a 2 p.m. matinee on Sunday at Juneau-Douglas High School. The opera is also being recorded for possible later broadcast on 360 North. Editor’s note: The Orpheus Project is contracting 360 North to record The Princess Sophia opera and promoted it through KTOO underwriting.